Having endured the winter of 1133 at Skelldale, the community sought affiliation with the Cistercian Order, in order to receive the guidance and support of the Cistercian family, instead of functioning in isolation. 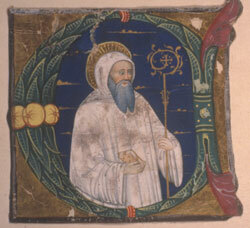 The monks decided to subject themselves to Clairvaux Abbey, in Burgundy. They sent a letter to the abbey’s charismatic leader, Bernard, explaining their departure from St Mary’s, their present situation and hopes for the future. They hoped that Clairvaux would be their mother and Bernard their father, who would advise and support them in all matters. Bernard responded with a positive and encouraging letter, fully approving of their decisions and commending their way of life. (33) In 1135 the community was formally welcomed within the Cistercian family. You have grown hot again with the fire of God, grown strong from weakness, bloomed afresh in holiness. This is the finger of God working subtly a wholesome change, not turning bad men into good, but good men into better.